The Southeast Asian Ministers of Education Organization (SEAMEO); the Ministry of Education, Culture, Sports, Science and Technology, Japan (MEXT); the UNESCO Asia and Pacific Regional Bureau for Education; and the Bank of Tokyo-Mitsubishi UFJ, Ltd have launched the SEAMEO-Japan Education for Sustainable Development Award. In view of recent natural disasters such as earthquakes, floods, tsunamis, cyclones, landslides, etc. 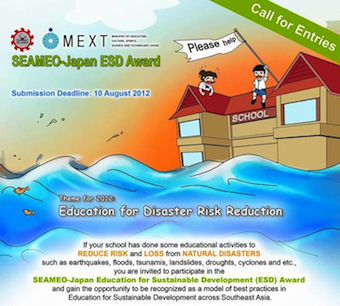 that have caused massive destruction, including the loss of lives and a devastating effect on communities in Japan and Southeast Asian countries, the theme of 2012 SEAMEO-Japan ESD Award is “Education for Disaster Risk Reduction”. All public and private schools in the 11 Southeast Asian countries, namely Brunei Darussalam, Cambodia, Indonesia, Lao PDR, Malaysia, Myanmar, Philippines, Singapore, Thailand, Timor-Leste and Vietnam are invited to submit information about their respective school’s activities/programmes related to the theme “Education for Disaster Risk Reduction”. 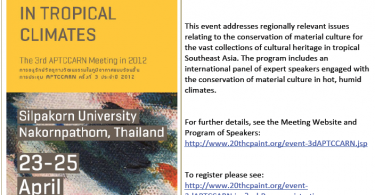 The last day for submission of entries is on 25 August 2012. The award will be given every year from 2012 to 2014 to promote and share best practices in ESD in schools across Southeast Asia.